Yea can’t see why not? Give it a go mate I have caught squid even with the real cheap jigs. Lightningx wrote: Yea can’t see why not? Give it a go mate I have caught squid even with the real cheap jigs. Picked this up at Trellys in Shepparton...Koolabung Codcraker. This color lure is popular but unfortunately has been discontinued so I have the last one left in the world and could be valued at $500! I am open to offers! 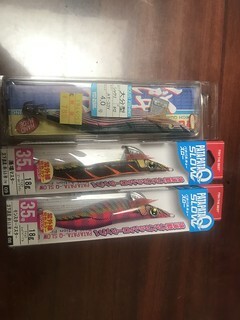 OK...there are sh!tloads of these lures left and they are not discontinued but I am just trying to inflate the cost as this was purchased at $25 for a young member here..so I will accept $300! April Fool wrote: Picked this up at Trellys in Shepparton...Koolabung Codcraker. Had a friend go to Japan and brought these back for me. what are the prices like over there? Good if you want swim baits etc. Jackals are good price. THey have second hand lure shops too from what my mate said.